Astonishingly, the researchers for Most Dangerous Man in America actually found the film clip of McNamara in 1966 descending from the plane and stepping to the cameras to lie to the press — with me behind him, recognizably! (the filmmakers put a circle around my head). As I’ve often said: “If you can’t stand official lying, you couldn’t work for the government for two weeks.” I was in government service or consulting for a decade. It was, of course, in 1969, what the fifth president in a row was lying about, on these matters — mass murder (as I had come to see it just that summer, after reading the volume in the Papers about the origins of the war) — and my inside knowledge that the murder was going to continue, indefinitely, and almost surely escalate (which it did, in the air), plus the examples of draft resisters who were choosing to go to prison to tell the truth about the war, that it was wrong — that inspired me to follow their example. 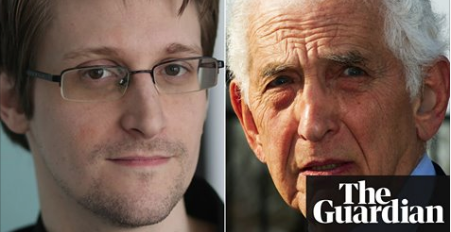 With Spielberg’s The Post film bringing renewed interest in Daniel Ellsberg, The Guardian published a conversation with Daniel Ellsberg and Edward Snowden, who they called “the two most famous whistleblowers in modern history”. I’ve had more than a passing interest in the splash arrival this month of Steven Spielberg’s movie The Post, starring Meryl Streep and Tom Hanks, which covers the Washington Post‘s role, in 1971, in publishing the so-called “Pentagon Papers,” a top-secret government study of United States involvement in the then-still-raging Vietnam War. Judith Ehrlich and I spent four years creating the on-screen story of the man who leaked that Pentagon study to the press, in our 2009 documentary, The Most Dangerous Man in America: Daniel Ellsberg and the Pentagon Papers. So I’ve been waiting with bated breath to see what this stellar Hollywood team would do with similar events. The Oscar-nominated film The Most Dangerous Man in America: Daniel Ellsberg and the Pentagon Papers is now available to watch online streaming or download in the player below. This version is licensed for personal, home use only and may not be used in educational settings or for public screenings. DVDs for both educational or home use area available to purchase here. The film also available for streaming to educational institutions through New Day Films. Steven Spielberg’s much-heralded new film “The Post”, starring Meryl Streep and Tom Hanks, tells the story of the Washington Post’s groundbreaking legal struggles to publish the Pentagon Papers in 1971. The film is very timely considering President Trump’s attacks on the press. The Post opens with several scenes featuring Daniel Ellsberg, played by Matthew Rhys. While the scenes are accurate of Ellsberg on a plane with Secretary of Defense Robert McNamara, copying the Pentagon Papers, and later handing them off to Ben Bagdikian, they are very compressed history and only skim over Ellsberg’s story. The Most Dangerous Man in America film presents the full story about Daniel Ellsberg and the Pentagon Papers, and is must-viewing for anyone who sees The Post film. The film includes the actual footage of Ellsberg and McNamara. The Most Dangerous Man in America is now available to stream online, download or purchase on DVD for home or educational use. See all options here, or watch below on Vimeo. An article at BillMoyers.com compares and contrasts Daniel Ellsberg and Julian Assange and their roles in disseminating government and private secrets. To find out about their take on what makes a “good” leak and what differs between these two, click here. Director Judith Ehrlich has embarked on another film project documenting the history of the Vietnam war resistance. The Boys Who Said NO! is the story of 3,250 young Americans who tried to stop the Vietnam War by going to prison rather than enter the military. Why did they choose prison? What happened to them? What was their impact on the war and the draft? To find out more about this compelling film (or pursue the opportunity to have dinner with Judith Ehrlich and Daniel Ellsberg, or lunch with David Harris, co-founder of The Resistance!) click here. In a speech presented to the Dresden Peace Prize 2016, Edward Snowden acknowledges the importance of inspiration from Daniel Ellsberg (and “The Most Dangerous Man In America”). “The film that you recently watched, (“The Most Dangerous Man in America”) is one that I myself watched. But it wasn’t this year or the year before. It was in the year 2012, the year before I came forward. In (Daniel Ellsberg’s) example, seeing what he could see, the choices that he faced, seeing how he struggled with the same sort of moral complexities that I myself was unable to resolve, helped me see that there was a model from people that came forward before. At different – at higher levels! Even more deeply embedded in government understanding. And they came to the conclusion that it was not enough to recognize, that something is wrong. It is not enough to simply raise a good point. We have not just the right but the moral obligation to ourselves and to society if we have the capability to achieve positive result for our families, for the future of our countries. Click here to see the complete speech by Snowden. In an article at Inside Climate News, writer David Sassoon describes being inspired to pursue investigation into Exxon’s knowledge about climate change by Daniel Ellsberg.